Rushdie, an Indian-born British novelist who has nothing to do with the film, was condemned to death in 1989 by Ayatollah Ruhollah Khomeini, Iran's late leader, over his novel "The Satanic Verses". 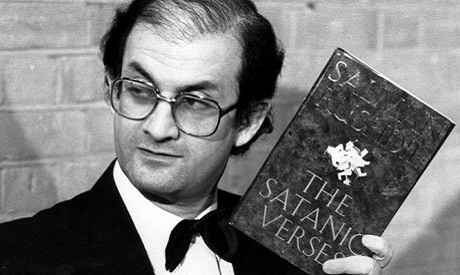 Salman Rushdie holding his novel "Satanic Verses". An Iranian religious foundation has increased its reward for the killing of British author Salman Rushdie, in response to a U.S.-made film that mocks the Prophet Mohammad, sparking protests across the Muslim world. Rushdie, an Indian-born British novelist who has nothing to do with the film, was condemned to death in 1989 by Ayatollah Ruhollah Khomeini, Iran's late leader, over his novel "The Satanic Verses," saying its depiction of the Prophet Mohammad was blasphemous. Khomeini's fatwa - religious edict - was condemned in the West as incitement to murder and an assault on freedom of speech, but a wealthy Iranian religious organisation has offered a large reward to anyone carrying it out and decided to increase the bounty amid the furore over the online film. "I am adding another $500,000 to the reward for killing Salman Rushdie, and anyone who carries out this sentence will receive the whole amount immediately," said Hassan Sanei, the foundation's head, in a statement carried by the Iranian Students' News Agency (ISNA). The reward offered by the state-linked foundation now stands at $3.3 million, ISNA reported. "Surely if the sentence of the Imam (Khomeini) had been carried out, the later insults in the form of caricatures, articles and the making of movies would not have occurred," said Sanei, who is also the foundation's representative to Ayatollah Ali Khamenei, Khomeini's successor as Iran's supreme leader. Rushdie, speaking on British radio before the news of the increased bounty, called the film "idiotic ... a piece of garbage" but he also condemned violent protests against it as "an ugly reaction that needs to be named as such". The U.S. ambassador to Libya, Christopher Stevens, and three other Americans were killed in Benghazi, Libya, last Tuesday and several other people have died in protests around the Muslim world against the amateurish video, "Innocence of Muslims". Iranian officials have demanded the U.S. apologise for the video and say it is only the latest in a series of Western insults against the holy figures of Islam. In 1998, under reformist President Mohammad Khatami, Iran's government distanced itself from the Rushdie fatwa, but hardline groups regularly renew the call for Rushdie's death, saying Khomeini's decree is irrevocable and eternal.